- So Rider Nation, what are your thoughts on CFL free agency and what your team has done so far? I think for the most part, you have to be pleased with what has gone on. Yes, the loss of Henoc Muamba was a tough one to take, but the $$$$ weren't there. There are some other questions to ask like who plays left tackle if Bruce Campbell doesn't come back and who slides in that spot if Campbell does back for the first two games? Who replaces Kacy Rodgers? There is still a lot of time before training camp to answer those questions. - The biggest move made was perhaps the one that everyone called; Zack Evans coming back to Saskatchewan. 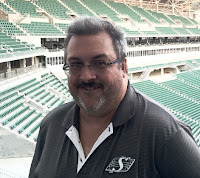 Yes, losing him in the expansion draft was a move no one saw coming except for the REDBLACKS as the Rider regime back in the day took a gamble that failed. What we saw was Evans develop into one of the best interior d-linemen in the league with a Canadian birth certificate. This has the potential to be a huge signing for the /=S=/. Evans might have wanted to take a day or two before making a decision because I'm sure his services were sought after, but he knew where he wanted to go and the offer was right so why wait? - The Jerome Messam signing makes me wonder what the team will do with its existing stable of running backs. As I said on the Sportscage Wednesday, unless there is something we don't know when it comes to Trent Richardson and his status, I have to think Cameron Marshall could be the odd man out. That is no slight on Marshall either. I just think the Riders probably think more of what Richardson can bring them after doggedly pursuing him to come north. I don't think Marshall gets cut, but perhaps he gets traded to find that middle linebacker or left tackle that could be needed. Is Toronto an option? What about Montreal or Hamilton? Messam says he turned down both of those teams so they are obviously looking. - I realize we are going into what could be a rather contentious bargaining session for a new collective bargaining agreement, but I am getting tired of these one-year deals that are being signed. It does nothing for team consistency, it does nothing for team jersey sales, it does very little for the community and the work players do in it. How can you establish a firm relationship within the community when you are on a one-year deal? I fully understand why the one-year deals are being signed across the league, but show some faith in your team and system and sign some multi-year contracts. Do players just want to be mavericks travelling from city to city or do they want to set down roots and play in whatever city and maybe raise a family in that city? Maybe in this day and age, I'm out to lunch on this issue, but the one-year deal doesn't excite me at all. That being said, the Riders are taking full advantage of this it would seem by signing guys to big one year deals. They are all-in for this season and then they will see where the economic climate can take them in 2019. You really can't argue that approach when it is available. - Did Nik Lewis spill the beans or some hot air Thursday night? As we know, commissioner Randy Ambrosie is going across the country listening to fans and part of his town hall meetings revolve around the schedule and the thought process about moving it up. Lewis says it's already a done deal and that the reason the sked is being moved up isn't because of the fans, its because the NFL Network is paying the league to move games up so they can be shown. Lewis goes on to say that he doesn't understand why the PA hasn't made an offer already. If what Lewis is saying is true, and one can't discount it at this time, it means more money will be on the table - money the players will want. - The Regina Pats are going to make the playoffs. There is no doubt about that as far as this blogger is concerned. After that, who knows! Unless there is a sharp increase in play, this team will be done once they face the Broncos or Warriors. While the Pats have played with those two teams in the four games they have played against them since the trade deadline, the bottom line is they have 0 victories to show for it. They played well against Swift Current, but didn't get the two points. Moose Jaw came in here and blew their doors off in the first period in the first matchup between the two and on Wednesday, they used a 43 second stretch to win again. As frustrating as it is for the fans, I can't imagine what it must be like for John Paddock and crew. Paddock remains as cool as a cucumber when talking about his team to myself and others, but once the office door is closed, he must be seething knowing they are so close, but so far away. - Hometown Hockey comes to Regina this weekend with everything being set up in City Square Plaza. If you get a chance to see Ron McLean do his thing, take advantage of it. There is no one better in this country at doing what he does than McLean. I can't say enough good things about him. - Being a Pats fan in the late 70's and early 80's and doing lap after lap after lap around the Agridome, there was no better line than that of Dave Michayluk, Wally Schreiber and Jock Callander. To this kid, they could skate around the ice and do whatever. They could seemingly score at will. In the 1981-82 season, Callander had 190 points, Michayluk had 173 and Schreiber had 111. You can't find a line to even come to close to that today. Oh by the way, some guy named Derkatch had 142 points. That team might have been my favourite all-time Pats team. That was the one coached by Bill Laforge that could score and could fight. That squad had the likes of Jeff Crawford, Marc Centrone, Garth Butcher and Al Tuer on it. What a team! Michayluk was my favourite out of the bunch and is still one of my favourite all-time Pats. Callander was right up there too, so I was very happy to hear his number would be retired Sunday before the Pats-Warriors game. It is going to be a great weekend under the dome so take it in and soak in homecoming weekend whether it be by taking in the alumni game Saturday, the WHL game on Sunday or both. - By the way, why is this centennial gala dinner being held tonight when the team is in Moose Jaw playing a game? Shouldn't John Paddock and his players be a part of the big dinner and the festivities. Give them a chance to rub elbows with those in attendance? That's a head-scratcher! - The Regina Red Sox are bringing Todd Stottlemyre to town to speak at their annual dinner April 28. Stottlemyre was not one of the players who comes to mind when you think of the two Toronto teams that won the World Series, but he was front and center in maybe the wildest game of those two World Series playoff runs as he started that 15-14 win in Philadelphia and had one of the more awkward slides in baseball history. He will have some stories to tell. - No surprise to see Dave Taylor's Cougar women's basketball team beat UBC to take the opener of their Canada West semi-final. Can we just have the Cougars and Huskies play a best of 5 to determine the Canada West champ? I don't know how the seeding will work when it comes time for nationals, but if the draw works out to the point we see a U of S/U of R final, they might have to put some TV's in the lobby outside the CKHS for fans to watch what is going on inside. It will be an atmosphere second to none. - Does Steve Simmons actually realize his column on mixed curling which was sooooooooo off base this week has given the sport more promotion and increased awareness? The curling community let Simmons know what they thought about his thoughts. Simmons went to Twitter the other night to acknowledge that and add no one from figure skating got on his case for the team figure skating event which he also believes is a sham. Hmmmmmmmmm!!! - That's all I got. Enjoy the long weekend. Get out to the Brandt Centre if you can for what should be a great weekend of hockey. The Bill Laforge Pats were great! We will never ever see a team like that in any level of hockey again. What an era for Pats hockey with those guys. Good question on the gala. Somewhat strange! I had to look up the numbers of that team. WOW!!! Those are mind-boggling numbers both with points and PIM's. That was hockey at its best much like the days of the Oilers in the same time-frame. Wish we could even get close to that now. Also tired of all the 1 year contracts. Not like a multi year deal means anything from a players perspective anyways though. Total sham. The Riders are going all-in for this year. Who has a problem with that? The landscape may change drastically in 2019 and beyond so take your shot now and hope you can keep as many and make a run in 19, 20 and 21. In Jones I trust. Regina Pats will play in the WHL playoffs and the Memorial Cup Championship 2018. End of story. Yes I am one of those nerdie fans projecting players income to figure out how close we are to our cap. I have done this for the last 3 years and I feel I am pretty close but then again I am guessing. Probably no different than Justin Dunk. Right now I see the Riders at $4.5 Million so we still have some space. The Riders need money for Bruce Campbell, maybe $150,000. If Mitchel is correct and we need a MLB, why not Kyres Heibert. He is about $110,000 and has already received his bonus. But our team has been built for Canadian at the MLB spot. 1) Sam Hurl 2) Brandyn Bartlett 3) Kevin Francis 4) Dillon Grondin 5) Cameron Judge. We have been developing these players and using our drafts to get these kids. Any chance these kids have a ceiling none of us fans see……I just can’t see an America MLB as a need. Mitchell is also saying using Jerome Messam and one of the two American boys is out of the Question. I see these boys all meshing together to give our offense multiple looks. Imagine Messam and Trent Richardson in the same backfield but then making a change-up using Marcus Thigpen. Thigpen I am sure will be used on special teams returns with Christion Jones and Chad Owens. Remember Owens sat on the 6 game injury list for most of last season and came on latter in the season fresh and super productive, and most of his Salary was Cap exempt. Finally you mention we need a Defensive Tackle, I assume a Canadian which I would agree. I suspect Eddie Steele will fit this role at a reduced cost over last year, perhaps at a $75,000 cost. With the Riders signing the 3 new Canadians, I have to feel these guys are developing for the future. If they have a good ceiling of potential and are prepared for Taxi Squad participation our future is bright. We are also developing 3 Canadian O-line who on paper look to have a good future. I am sure the roster is evolving but we have to be close to our Training Camp boys. The problem @ LB??? You're missing Muamba, Knox & Foster. Sure Moncrief will fill in for Foster but all your "kids" have practically zero experience, especially when you take the season Francis played (& not very well) at safety. In other words as it stands now your whole LB crew is going to be new so filling them up with training camp tryouts & these kids may be an option in the eyes of Rider fans who see all these guys as budding stars but I don't like your chances putting inexperienced "kids" across your LB group who haven't played together either. Keep in mind if you look at your last 2 drafts under Jones not one player is a regular yet. The ones who are around are all special teams players. So now these guys are all going to be filling in as regulars? YOU may not realize it, but you have a problem at linebacker. Take the blinders off.